If you’re visiting this site, chances are you love making mead. But have you ever wondered how the alcohol actually gets into the mead? I mean, let’s face it, mead tastes great, but alcohol puts the fun in our delicious ambrosia. And while it may seem magical to the mead drinkers of yore, the alcohol in mead has nothing to do with sorcery, it arrives to us through lovely science. How? Why? You’re probably wondering. While your esoteric “why” question is well beyond expertise of this author, today I will attempt to explain the how alcohol is created through fermentation without getting too nerdy on you. The fact that alcohol and mead has been around for thousands of years is pretty amazing, even more amazing is that we did not really understand how it was made until fairly recently. However this process of yeast, as a single cell, living organism converting sugar to alcohol was only first theorized in 1835 by French inventor Charles Cagniard de la Tour who had been studying yeast, among many other things. Since then, yeast has been studied and modified many times over to improve its fermentation and ethanol production efficiency to create the yeast we use today for creation of mead, beer & wine. Lucky for us, water is in abundant supply on planet earth, the sugar obviously comes from the honey, and so do most of the nutrients needed to make good mead (as we’ll see later, typically not enough, however, for the highly drinkable mead that we know today). Why is honey such a great source for alcohol production? To answer that question fully, we need to explore the process in which MAKE the honey. We will begin with an Orange blossom tree, a common source of nectar for mead honey. 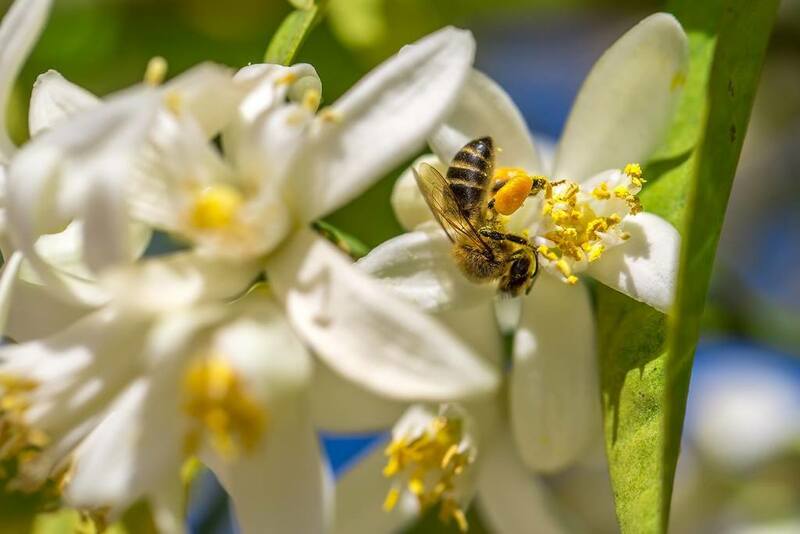 The flowers on the orange blossom tree attract the local bees with their nectar. Nectar is not particularly sweet and is fairly clear, watery liquid. It is certainly is sugary though, loaded with a complex sugar known as Sucrose. The “Forager” bees will drink this liquid and as it flies from flower to flower the nectar mixes with an enzyme from the bees salivary glands called invertase. Once in the stomach the enzymes begin to convert this complex sugar into 2 forms of more simple sugars, Fructose and Glucose. When the bee arrives back to the hive it well regurgitate the liquid (that’s right, vomit) and a “House” bee will quickly drink it up again. More enzymes go to work on the liquid and that bee will regurgitate it, only for another bee to drink it up. This process repeats multiple times until the water content of the liquid is reduced from 80% down to about 20%. The sweetness of the simple sugars have also increased, so it is much thicker and sweeter than when it was drawn from the flowers. This liquid is regurgitated one last time to a honeycomb and the last bit of water evaporation takes place by the beating of the bees wings. Water content is now down to about 16% and *viola* – honey has been made. This supersaturated solution of sugars is also recognized as a “super-food” as it also contains important vitamins, minerals, amino and organic acids that the yeasts need to function, and important fragrance compounds that helps make each batch of mead unique. Now that we understand how honey is made, as well as key ingredients in alcohol production through fermentation, let’s get right into the fermentation process. The basic principle of fermented alcohol is pretty simple. A single cell organism called yeast, found just about everywhere on earth, work to converts sugars (glucose) into heat energy, ethanol (alcohol) and carbon dioxide. 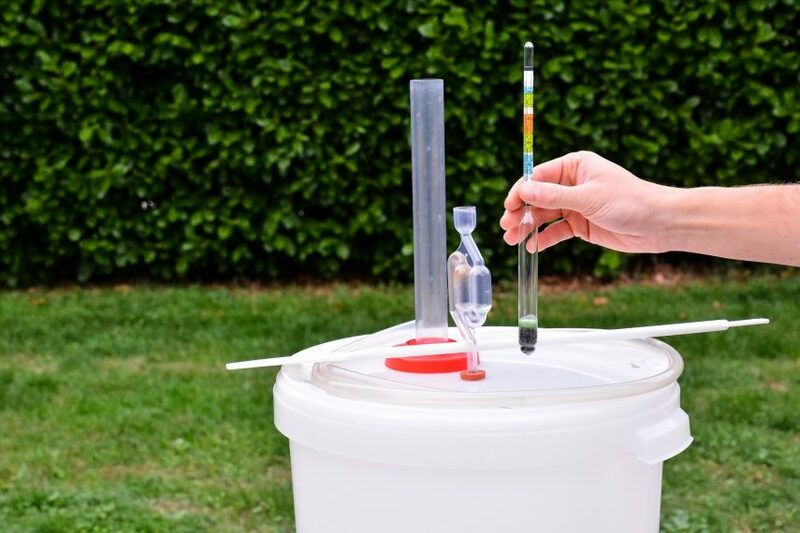 While the equation looks pretty straight forward, quite a few steps are taking place and during this process many things will affect how well this reaction takes place, which makes creating mead an art. The glucose levels of the honey, the effectiveness of the yeast the environmental conditions the exposure to temperature and oxygen all play a part in this process. A single glucose molecule gets broken down into 2 molecules of pyruvate this reaction is exothermic so heat is ejected. This is why your fermentation gets warm as it works. The 2 pyruvate molecules are then broken down into 2 organic compounds know as acetaldehydes and 2 carbon dioxide molecules. The carbon dioxide is the bubbling byproduct that can be released from still beverages or forced to stay in the liquid for sparkling beverages. The final conversion takes the acetaldehydes to ethanol and creates a nice balanced formula with a resulting effect on the human body that is equally pleasing. And there you have it. We have taken the journey from the discovery of the power of yeast to the repeated vomiting of bees to make honey and how the sugars are then converted into an alcoholic beverage. I hope that this has given you an insight into what was a complete mystery for thousands of years to so many mead, beer and wine makers. It is good that the lack of true understanding did not get in the way of an opportunity to produce and consume alcoholic beverages.